Size: Ammonite is 8 inches across! This is a spectacular ammonite fossil. It is a fabulous specimen of Asteroceras stellare from the Froddingham Ironstone of England. This specimen was recently acquired from a major fossil collection. This ammonite has been highly polished to reveal the gorgeous coloration, distinct ribbing, and intricate suture pattern of the cephalopod. The inner whorls of the ammonite are well preserved, and the individual body chambers are clearly defined. The brown, green, white, and gold coloration is totally natural - it has not been dyed or artificially colored in any way! 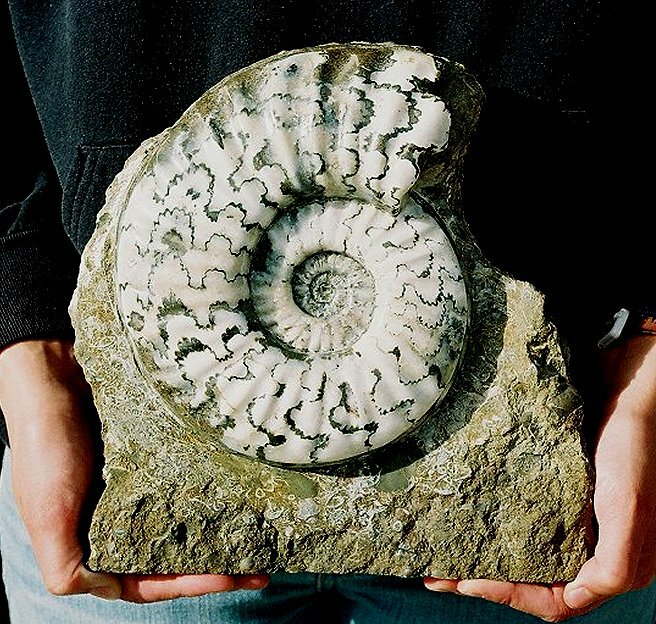 The ammonite is beautifully showcased on its natural limestone base, making this a world-class display fossil. And the fact that the ammonite is a full EIGHT INCHES ACROSS makes this one of the more impressive examples of this type. This is a top quality specimen of this classic ammonite fossil from England, simply a magnificent fossil.